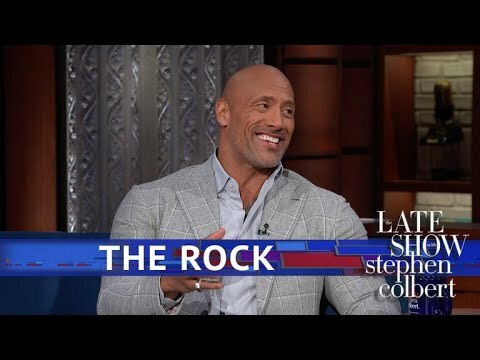 (WATCH VIDEO) 'Skyscraper' star Dwayne Johnson settle an old score over whose eyebrow raise is more impressive. Oh, and there's tequila. HEY, EVERYBODY, WE'RE HERE WITH DWAYNE JOHNSON. YOU SEEM LIKE A WINNER. DO YOU ACTUALLY TAKE THAT POBTD SERIOUSLY? >> I ABSOLUTELY DO, YES, YES, I DO.. IT KIND OF PICKED UP STEAM. PUBLIC KIND OF THOUGHT ACTUALLY, THAT'S A GREAT IDEA. SO I SAID YES, I WOULD CONSIDER IT. AND OF COURSE I WOULD. BUT AT THE SAME TIME, STEPHEN, LOOK, I'M NOT DELUSIONAL AT ALL. TO WORK AND GET SOME EXPERIENCE, YOU KNOW, AND UNDERSTAND POLICY. >> Stephen: AND GIVE IT 110 PERCENT. >> I WOULD GO BACK-- . >> Stephen: BECAUSE IT IS EITHER PRESIDENT OR USED CARS. ACCESS TO NATIONAL SECURITY SECRETS. AND YOU KNOW WHAT I AM ABOUT TO SHOW THESE PEOPLE. HOME OF THE BRAVE, DAMN PROUD TO BE AN AMERICAN. >> BUDDY, I WAS RIGHT THERE. >> Stephen: WHAT DOES THIS MEAN, WHERE DID THIS COME FROM. >> YOU KNOW, I HAVE FRIENDS IN HIGH AND LOW PLACES. >> AND WHEN I HAD RECEIVED THAT, I WAS-- . >> I CANNOT SAY FROM WHOM IT WAS. >> Stephen: YOU TWEETED IT. >> Stephen: BIDEN, RIGHT, BIDEN TOLD YOU. >> I CAN'T SAY AND THEN I GET A FOLLOWUP TEXT. >> Stephen: IT WAS BIDEN. (LAUGHTER) >> I CAN'T SAY. HAD TO PUSH THE PRESS CONFERENCE FOR ANOTHER HOUR. OH, BUT IT JUST WENT OUT. (CHEERS AND APPLAUSE) YOU DON'T WANT-- . >> Stephen: YOU MADE ME PROMISE TO ASK THAT. PLEASE ASK ME TO OPEN MY SHIRT, IT'S VERY IMPORTANT. HERITAGE INFORMS WHO YOU ARE. AND FINALLY SETTLED IN CANADA. AND MY OTHER HALF, WHOOO FOR CANADA. IS MY MOM WHO JUST DID THAT, BY THE WAY. AND WE SING AND WE PLAY UK LAY LAY AND WE DANCE. >> Stephen: YOU DO SING, YOU SANG IN MONA. I DID, YES, THANK YOU SO MUCH. HOW DID YOU TRAIN FOR THAT? WELL, I WASN'T NERVOUS ABOUT SINGING IN MONA. REALLY NICELY, HE IS AMAZING, OF COURSE. SINGING SAMOAN SONGS, HAWAIIAN SONGSZ AND THINGS LIKE THAT. LIKE IN SAMOAN BECAUSE I DON'T KNOW, LIKE SAMONA SONGS. A SAMOAN SONG, LET'S SEE-- . ON THE, IN THE MOVIE, YOU WARMED UP WITH A LITTLE TEQUILA. WOULD YOU BE-- INTERESTED IN? >> Stephen: I DON'T WANT, DO YOU WANT. >> I DON'T LIKE TO DRINK ALONE. >> Stephen: NO, I WILL DRINK WITH YOU. >> A SIP, ARE WE SIPPING TZ I DON'T THINK SO. YOU DIDN'T LOOK ME IN THE EYE. I'M KNOWN FOR MY EYEBROW, OKAY. >> Stephen: OKAY, TEACH ME A SAMOAN SONG. >> LET'S SEE, SAMOAN SONG. >> Stephen: WHAT DOES THAT MEAN? HAVE NEVER LOOKED A MAN DIRECTLY IN THE EYE WHEN I SANG THAT. >> TO HELL WITH THE MOVIE, LET'S DRINK! >> Stephen: ROLL THE CLIP. >> THANK YOU SO MUCH FOR BEING HERE. WE'LL BE RIGHT BACK WITH A PERFORMANCE BY ALESSIA CARA.